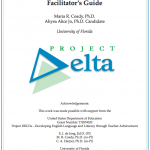 Welcome to Project DELTA’s ESOL (English to Speakers of Other Languages) professional development videos. These videos are intended for teacher-educators in teacher education programs, either with infused content and/or stand-alone coursework in ESOL. The videos were designed in consideration of a two- course, ESOL infused teacher education program model, such as the ProTeach program at the University of Florida. However, varied other teacher education programs, institutions of higher education, or local school district professional development (PD) programs in ESOL may find these videos useful to prepare teachers or to reinforce teacher learning in professional learning communities. The two videos are divided into four segments. Video 1 has two segments. Segment I introduces viewers to the specific considerations of mainstream teachers in K-2 (lower elementary level), inclusive classrooms. Segment II builds upon that content and adds teaching strategies and literacy development of ELLs. Video 2 has two segments. Segment I introduces viewers to mainstream teacher practices in the upper elementary level in a content area class (mathematics). The segment addresses lesson planning, gradual release, and identifying vocabulary for ELLs in inclusive classrooms. It also addresses the use of visual aids for ELLs. Segment II builds upon that content and adds grouping strategies and home-school communication practices. The average length of each video is 35 minutes, and the average length of each segment is 16 minutes. Specific video lengths are provided below, along with an Overview of each segment, the Highlights of each video, Discussion Questions, and References or additional information to extend learning. We invite you to share and use these videos. Thank you for viewing! The purpose of the two videos is to facilitate the preparation of mainstream, elementary teachers in inclusive classrooms who will or who are currently are working with English Language Learners (ELLs) throughout the state of Florida and the United States. The videos were conceptualized as a response to the limited availability nationally of training materials (videos) to prepare mainstream teachers of ELLs to work in inclusive settings. This work follows a theoretical framework, surrounding specialized teacher practices for ELLs (Coady, de Jong, & Harper, 2011; de Jong, Harper, & Coady, 2013). 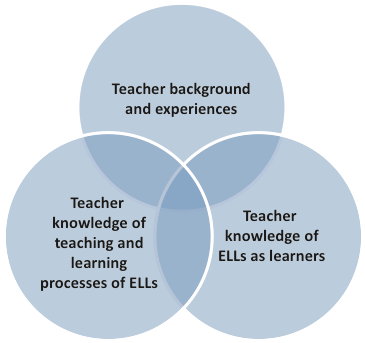 The three dimensions of the frame- work include: (1) teacher knowledge related to second language teaching and learning processes; (2) teacher preparation, background, and experiences, including formal and informal types of preparation; and (3) teacher knowledge of ELL students as learners. We view these three dimensions as interrelated and intersection (Coady, de Jong, & Harper, 2011; see Figure 1 below). In addition to the theoretical underpinnings of this work, the study guide reflects sociocultural theory, which situates learning in its social, cultural, and historical contexts. This underscores the concept of human development and student learning as embedded in social interactions. Tharp and Gallimore (1988) describe this perspective as having profound implications for teaching, schooling, and education. A key feature of this emergent view of human development is that higher order functions develop out of social interaction. Vygotsky argues that a child’s development cannot be understood by a study of the individual. We must also examine the external social world in which that individual life has developed. With respect to the four videos referenced in this Facilitator’s Guide, a sociocultural perspective underscores the situatedness of these two classrooms. The instructional decisions made by teachers, the standards (learning objectives) she follows, and the manner in which she approaches and implements the lessons are all responses to the context in which she teaches. Other contextual variables include the background and language abilities of the ELLs in the classroom and the resources available to the teacher. Hence, these videos are not meant to be standardized or generalize-able to any other classroom setting; they are for illustrative purposes and intended to be discussed in order to meet other, unique configurations of classrooms. In addition, viewers of this video are likewise situated in distinct sociocultural contexts. Viewers are encouraged to interact with each other and to share views and ideas. We argue that the social interactions and conversations that take place around the videos is where learning is likely to occur for viewers. The guiding questions found in this Guide are intended to be a starting point for those conversations to take place. Kim Cook is a mainstream, first grade classroom teacher with three ELLs in her inclusive classroom. In this video segment, Ms. Cook describes her ELLs and notes that she has one identified ELL with a learning disability. A second ELL is in the process of undergoing identification for learning disabilit(ies). All three of her ELLs come from Spanish-speaking homes. Preproduction: Students are not able to produce English. They communicate by using gestures and actions. Early production: Students are able to use one or two words or short phrases. Speech emergent: Students are able to produce longer sentences and complete sentences. Intermediate: Students appear to be fluent in English and able to engage in conversations.Errors may continue to appear in style or usage. Advanced: ELLs can typically communicate effectively in orally in social and academicsettings; however, they may continue to struggle with reading and writing. Note that language proficiency stages should take into consideration all four modalities of language, including listening, speaking, reading, and writing skills. Can you recall the language that Ms. Cook uses to describe each of her ELLs in the classroom? Why is it important to know ELLs’ home countries? Teacher talk to clarify the purpose of the text. Develop vocabulary before reading. “Frontloading” or pre-teaching vocabulary related to the text is necessary for ELLs. Preview to show students how to read the titles, headings, subheadings, and summaries in a book as ways of text. Anticipation guide to motivate students and help them to predict what will happen next in a text. Use of expression, pointing to pictures, and other nonverbal strategies to make the story (English language) comprehensible. How does Ms. Cook frontload vocabulary for her ELLs? What vocabulary does she choose to teach? How does she facilitate students’ prediction of the story? What roles do expression and nonverbal strategies (pointing) play in her Big Book lesson? What is “different” in the instruction for ELLs than for native English speakers? How can you learn about ELLs in your classroom, including their home language, culture, and literacy practices? As you reflect on what you have just seen in Ms. Cook’s classroom, can you answer the following questions? Why is teacher reflection an important part of teaching for all students and for ELLs in particular? What are some of the challenges that teachers of ELLs face? This segment consists of additional strategies used by Ms. Cook in her elementary, mainstream classroom. It builds upon part one and provides an extended literacy (Big Book) lesson. In this video segment, Ms. Cook uses multiple strategies to ensure that her ELLs can acquire the language of schooling. She uses many verbal and nonverbal strategies throughout the language arts lesson. These strategies designed to make language understandable, have been referred to as comprehensible input (Krashen & Terrell, 1981). How do her ELLs appear to respond? One of the key concepts mentioned by Ms. Cook is “academic language,” or the language that she feels all students, particularly ELLs, need to succeed in school. Academic language has been referred to as more demanding and complex than social, everyday language (Schleppegrell, 2004). It is also considered discipline-specific language or scientific terminology, reflecting complex sentence structures and low frequency words. For example, in Ms. Cook’s lesson, cottage is not a word that her ELLs are likely to know. In addition, students need to understand the academic language of predicting, drawing conclusions, and evaluating, in order to make sense of how the story came full circle. Why does Ms. Cook believe that academic language is critical for her ELLs? What strategies does she use with her ELLs to develop academic language? How might academic language differ across the various grade levels? What does Ms. Cook mean by having to “shift gears daily” in her instruction? Why is this especially important when working with ELLs? What kind of flexibility is there in the curriculum for teachers? Why might your modifications for ELLs to the curriculum differ from those in the teaching guide? Sasha Abreu is a third grade, mainstream teacher who teaches in an inclusive classroom with students from diverse backgrounds. She has four ELLs. This segment focuses on the use of visual aids and vocabulary-building techniques as strategies she uses to support English language learning in a math class. A. Comprehensible Input in mathematics (see previous page). Strategies to make language comprehensible for ELLs may differ across disciplines. For example, in contrast to Ms. Cook’s Big Book lesson in language arts (Video 1, Segment II), Ms. Abreu uses different strate- gies in mathematics. Note the techniques and instructional practices that Ms. Abreu uses in order to make language input comprehensible for her ELLs. What discipline-specific strategies does she use in mathematics? Some of Ms. Abreu’s strategies include rhyme, teaching the patterns in language (e.g., the ending –ths in mathematics), use of visual aids (such as the pizza), and the use of real world examples (related to “equal groups” and “equal”). The patterns and endings reflect the specific language objectives that Ms. Abreu set for her students. Language objectives are pre-determined and address the specific vocabulary, linguistic patterns, syntax, parts of speech, and other aspects of language that ELLs must learn. Can you identify additional strategies that Ms. Abreu uses in her lesson for ELLs? How does she structure the lesson so that ELLs can follow along? How does Ms. Abreu “set up” the use of Show Down? In other words, how does she make sure that her ELLs are able to participate in Show Down? How does Ms. Abreu use Show Down as an informal assessment of her ELLs? How can Show Down be modified for use in small (rather than whole) groups? As you reflect on what you have just seen in Ms. Abreu’s classroom, can you answer the following questions? How does Ms. Abreu build vocabulary in the lesson for her ELLs? What did not work in the lesson and how will she resolve it? This segment focuses on Ms. Abreu’s use of ESOL strategies in her math class. In addition to verbal and nonverbal strategies that facilitate her ELLs’ learning, Ms. Abreu uses grouping strategies to ensure that her students feel “safe” and are able to produce language in small groups. She also discusses home-school communication strategies with non-English speaking parents, and provides some suggestions for teachers of ELLs working in mainstream classroom settings. Ms. Abreu chooses to follow a gradual release model to facilitate learning of all her students. This model is especially useful for ELLs because their learning is “scaffolded” or supported by the use of modeling (by the teacher), group (together), and followed by a paired or independent demonstration of the work. Compare and contrast Ms. Abreu’s use of the Gradual Release Model (3-steps) with the model (4-steps) above. Why do you think she chooses to modify this with her ELLs? The use of students’ home language is crucial for home-school communication. Ongoing home-school communication between teachers and parents or caregivers has been found to support student learning outcomes. Federal guidelines dictate that teachers (schools) should communicate with students’ parents or caregivers in a language that they understand whenever possible. In addition, The No Child Left Behind Act (2001) sets an ambitious definition of parent involvement for districts and schools receiving Title I funds. In Section 1118 of the law, it defines the issue as “the participation of parents in regular, two-way, and meaningful communication” about student learning.” Communicating with parents is an important part of the teaching profession. Ms. Abreu uses her native language, Spanish, to communicate with Spanish-speaking parents of ELLs. Why is the use of the native language important for ELLs’ learning? How might the native language be used in your classroom? What considerations do teachers of ELLs need to take into account in order to use the native language to communicate with parents or caregivers? How does she demonstrate the think aloud strategy with her ELLs and why is it important? What is a gradual release model and how does Ms. Abreu uses this strategy in the teaching of ELLs? What advice does Ms. Abreu give new teachers of ELLs when planning a lesson? How does Ms. Abreu communicate with parents? What role does Spanish play in her teaching? Coady, M., de Jong, E. J., and Harper, C. (2011). Preservice to practice: Mainstream teacher beliefs of preparation and efficacy with English language learners in the state of Florida. Bilingual Research Journal 34(2), 223-239.
de Jong, E. J., Harper, C. A., and Coady, M. R. (2013). Preparing mainstream teachers for CLD students: Enhancing the knowledge and skills that teachers of CLDs must have. Theory into Practice 52(2), 89-97. Special Topics Issue, invited paper. Herrell, A., & Jordan, M. (2008). Fifty strategies for teaching English language learners. New York. NY: Merrill. Krashen, S.D. (1981). Bilingual education and second language acquisition theory. In Schooling and language minority students: A theoretical framework. (p.51-79). Sacramento, CA: California State Department of Education. Krashen, S.D. & Terrell, T.D. (1983). The natural approach: Language acquisition in the classroom. London, UK: Prentice Hall Europe. Peregoy, S. F. & Boyle, O. F. (2004). Reading, writing, and learning in ESL. Boston: Pearson. English language learners? TESOL Quarterly, 37, 105-133. Schleppegrell, M. J. (2004). The Language of schooling: A functional linguistics perspective. Mahwah, NJ: Erlbaum. Tharp, R. G., & Gallimore, R. (1988). Rousing minds to life: Teaching, learning, and schooling in social context. New York, NY: Cambridge University Press. Wright, W. (2010). Foundations for teaching English language learners: Research, theory, policy. Philadelphia, PA: Caslon.